Jungfraubahnen cogwheel trains travel to Europe’s highest mountain railway station in the Alps above Interlaken where Switzerland is at its most beautiful. The Jungfrau area near Interlaken is amongst the most beautiful regions of Switzerland and hugely popular with travelers and tourists from all parts of the world. 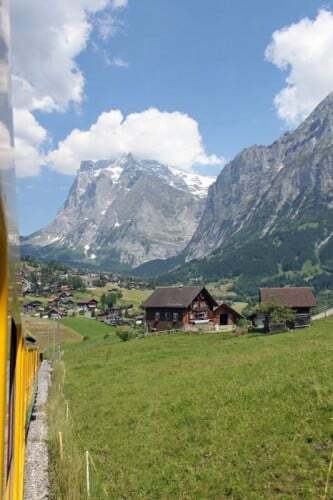 Since 1912, taking a cogwheel mountain train from Interlaken Ost to the Jungfraujoch has been a quintessential element of a trip to the Swiss Alps. 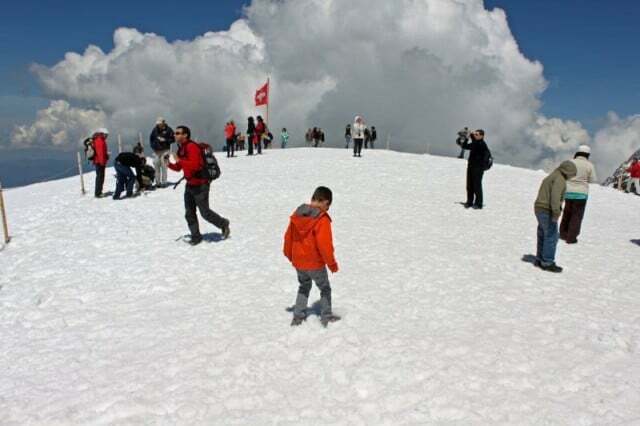 Jungfraujoch-Top of Europe Bahnhof is the highest railway station in Europe and offers splendid views of the Jungfrau and Mönch Alpine peaks, glaciers, valleys, and on a clear day, all the way to the Black Forest in Germany and the Vosges in France. 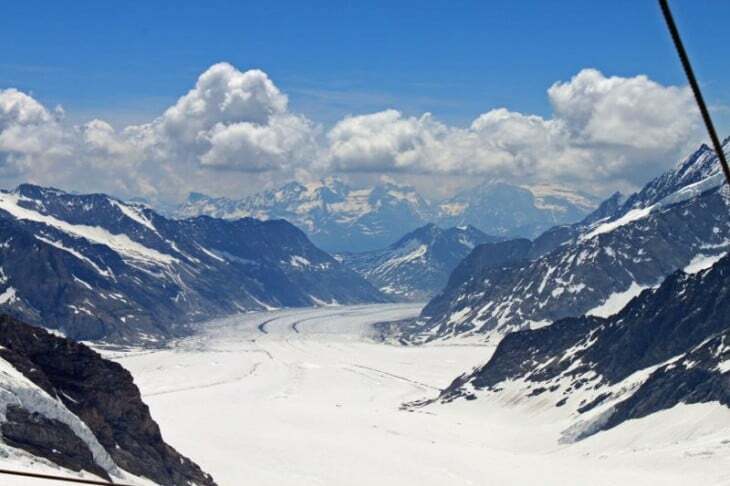 Many day-trip tours to the Jungfraujoch are also available from many parts of Switzerland. The Jungfraujoch-Top of Europe station at is at 3,454 m (11,333 ft) the highest mountain railway station in Europe. From Kleine Scheidegg at 2,061 m (6,762 ft), a 7 km (4 mile) long tunnel was dug through the rock of the Eiger and Mönch Alpine peaks for cogwheel trains to reach the Jungfraujoch (Jungfrau Saddle or Col) on gradients up to 25%. The cogwheel railway track to Jungfraujoch was completed in 1912 and has been in continuous use ever since. 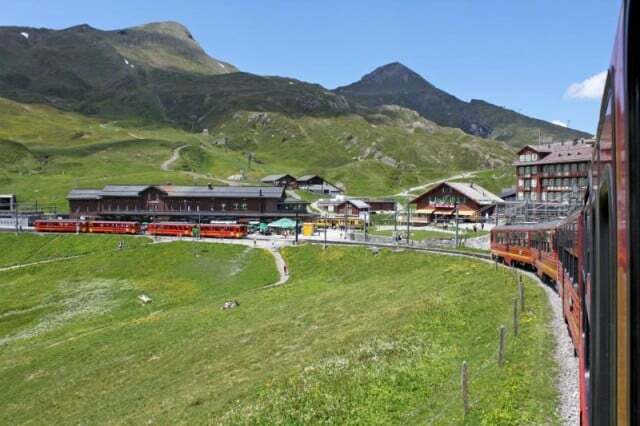 As trains arrive every half an hour or so, annually around half a million tourists are able to travel to the Top of Europe and enjoy the Alpine panorama without having to break out in sweat. 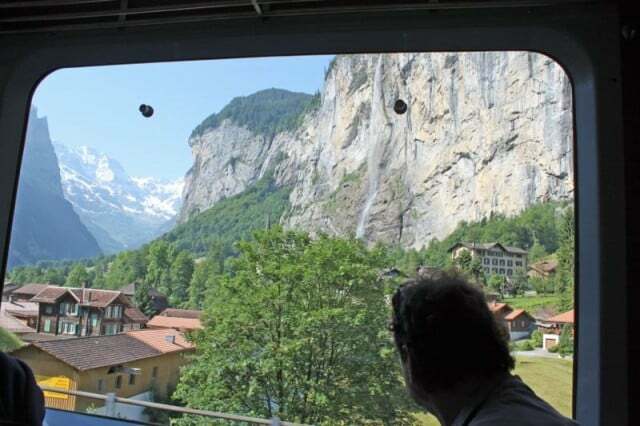 Most travelers on day trips to Jungfraujoch start their assault on the Alps by train from Interlaken Ost station. From here, three trains of the Jungfraubahnen train network are needed to get to the Top of Europe station. The total one-way traveling time from Interlaken Ost to Jungfraujoch-Top of Europe station is just over two hours. From Interlaken Ost (567 m / 1,860 ft), two routings are available to Jungfraujoch-Top of Europe station – either travel via Lauterbrunnen (796 m / 2,612 ft) or via Grindelwald (1,034 m / 3,094 ft). The time needed and the price of tickets are the same for both routes and it is possible to travel up via the one route and return via the other. Railway journeys from Interlaken to the Jungfraujoch start on the Berner Oberland Bahn (BOB) trains from Interlaken Ost station. Enter the correct carriage as the train splits in Zweilütschinen with different wagons traveling to Lauterbrunnen (20 minutes) and Grindelwald (35 minutes). 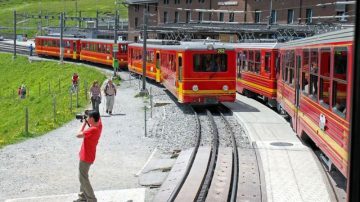 At either Grindelwald or Lauterbrunnen (via Wengen), change to a WAB cogwheel train heading towards Kleine Scheidegg. 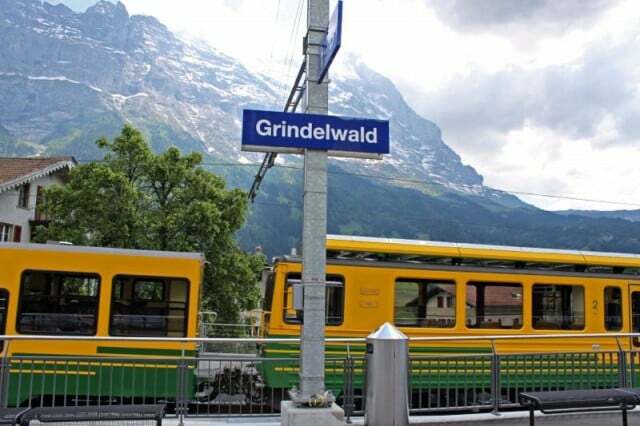 The train from Grindelwald takes just over half an hour while the trains from Lauterbrunnen need around 45 minutes to reach Kleine Scheidegg. From Kleine Scheidegg, the Jungfraubahn trains go through the mountain to Jungfraujoch-Top of Europe station. This last section of the route takes 50 minutes – up-bound trains stop twice at special viewing points inside the tunnel to allow passengers to get off for a few minutes of sightseeing. Traveling by train from Interlaken-Ost to Jungfraujoch-Top of Europe station is fairly simple. Train connection times are well coordinated and departure times will be delayed if a train arrives a few minutes late. On busy days, it is best to get onto the train as early as possible to get a seat. At really busy times, a second train may depart immediately after the regularly scheduled train. Seat reservations are not obligatory and only possible on some trains on the Kleine Scheidegg to Jungfraujoch-Top of Europe line. The reservation fee is CHF5 per single journey. The standard return fare from Interlaken Ost to Jungfraujoch-Top of Europe station is around CHF235 (summer), CHF185 in November and CHF210 rest of the year.. Most Swiss railway passes, the Junior Card, and further Jungfraujoch discount offers are available to make traveling to Top of Europe cheaper. Many excursion tours, e.g. Get Your Guide, also combine a visit to Jungfraujoch with other activities that could bring the total price down.